Our camp site in Snowdonia National Park has been chosen to feature in the Cool Camping guides - we are in the Top 3 sites in the new edition of Cool Camping Wales. We have also won a Green Snowdonia Award for Most Sustainable Camp Site. 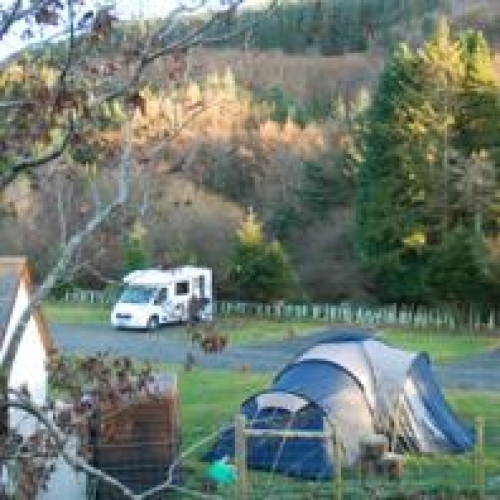 Campers with motorhomes, caravans and smaller tents can pitch safely on our peaceful 15 pitch touring site from March to December, where there are sweeping views over the Mawddach Estuary and surrounding mountains and easy access to washing facilities and showers. In peak season tent campers can also pitch on our lower camping fields in sheltered glades, secret meadows orhigh on a bluff overlooking the estuary - click here to check opening dates. We also have a pre-erected canvas bell tent for hire during July and August as well as our yurts. Near Barmouth - a sandy pebble and rocky composition 4.3 miles away.